The global autoinjectors market is anticipated to grow at a CAGR of 16.9% during the forecast period with its market size reaching USD 4.5 billion by 2024. The market is growing at a significant rate due to mounting occurrence chronic and lifestyle associated diseases, escalating occurrence of anaphylaxis, and advancement in technology. Autoinjectors is a small device designed to deliver a specific dose of a particular drug. These are usually spring-loaded syringes that are mainly invented for comfortable and safe dispensation of the drugs. Different autoinjector products including prefilled and fillable injectors contributed to the autoinjectors market size. The market has witnessed high demand for disposable autoinjectors in the coming years due to advantages of disposable autoinjectors such as handiness, less probability of infection, and easiness of use. Based on product, the autoinjector market is categorized into prefilled and fillable injectors. Of the two products, prefilled injectors hold the larger share in the market and it is predicted that the product category will also grow at the faster rate during the forecast period. On the basis of design, the market is categorized into standardized and customized injectors. Among the two, standardized design of injectors is the majorly sold category, whereas the market for customized design injectors will witness the higher growth during the forecast period. On the basis of type the market is subdivided into disposable and reusable autoinjectors. Advantages of disposable autoinjectors such as handiness, less probability of infection, and easiness of use are some of the factors responsible for the growth of the disposable segment. Of the two types, the disposable segment is expected to grow at the faster rate during the forecast period in the market. On the basis of therapeutic application, the market is subdivided multiple sclerosis, anaphylaxis, rheumatoid arthritis, diabetes and others. Of all therapies, rheumatoid arthritis segment is expected to grow at the fastest rate in the market due increasing occurrence of rheumatoid arthritis, globally. For instance, according to Centers for Disease Control and Prevention in 2017 approximately 54.4 million adults in the U.S. suffer from arthritis. The different end users of the market are hospitals and clinics and home care settings. Mounting need for self-administration drug delivery devices lead to the majority of autoinjectors consumption at homecare settings. The mounting occurrence of chronic and lifestyle associated diseases, increasing number of regulatory approvals, technological improvement and design advancement, escalating patient attentiveness and inclination of patients regarding self-administration, mounting self-medication practice, and promising reimbursements and government funding are the primary growth drivers for autoinjectors market. For instance, according to World Health Organization (WHO), globally the number of people with diabetes has risen from 108 million in 1980 to 422 million in 2014. In addition, according to International Diabetes Federation (IDF) in 2017, approximately 425 million adults were suffering from diabetes and are expected to reach 629 million in 2045 worldwide. Patent expiry of biologics, novel formulations and innovative drug delivery systems, conjoined with invention and improvements in the biological drugs, mounting healthcare expenditure, escalating occurrence of anaphylaxis and accessibility of generic varieties of autoinjectors are also facilitating the growth for the autoinjectors market. For instance, according to the World Allergy Organization, food allergy affects approximately 2.5 percent of the general population. Inclination for alternative drug delivery modes such as epinephrine nasal sprays and oral diabetic agents and oral insulin, dearth of appropriate training for consuming autoinjectors, high price of injectors and improvement of autoinjectors for multiple drug viscosities are the major challenges for the growth of autoinjectors market. Globally, the manufacturing companies trying to enter the autoinjectors market are required to maintain stringent regulatory standards. Moreover, the high level of capital requirement also poses a major barrier for the entry of new players. This offers an edge to the established players in the industry competition. Geographically, North America is the largest autoinjectors market as in the region the occurrence of chronic and autoimmune disease is increasing. For instance, according to Centers for Disease Control and Prevention (CDC), in 2015 approximately 23.1 million people in the U.S. had diabetes. In addition, mounting occurrence of anaphylaxis, mounting healthcare expenditure and promising reimbursement situation are also up surging growth of the North American autoinjectors market. For instance, according to the National Health Interview Survey (NHIS), in 2014, 5.4 percent US children under age 18 suffered from food allergy. In addition, according to Food Allergy Research & Education, approximately 15 million Americans have food allergies. Asia-Pacific is observed to witness fastest growth in the market, due to mounting occurrence of chronic and lifestyle associated diseases. 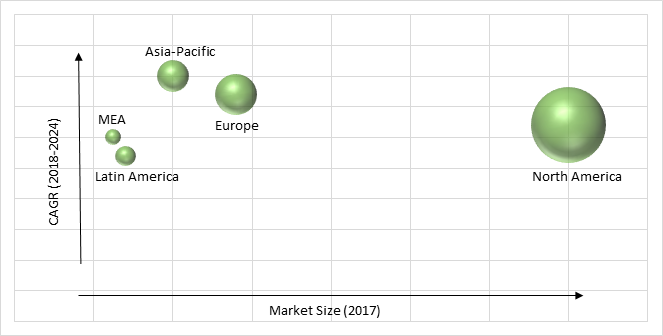 In addition, escalating occurrence of anaphylaxis, growing medical tourism and mounting healthcare expenditure are also creating a positive impact on the autoinjectors market growth in the region. Key players in the autoinjectors market are catering the demand of these devices by investing on technologically advanced products in their product portfolio across the globe. In December 2016, Mylan N.V. launched the authorized generic for EpiPen, as an autoinjector. Abbvie, Ypsomed, Consort Medical, Johnson & Johnson, Mylan, Becton, Dickinson and Company, Amgen, Haselmeier, ELI Lilly, Owen Mumford, Scandinavian Health Limited and Antares Pharma are the key players offering autoinjectors. Table 216 Snapshot – Mylan N.V.
Table 222 Snapshot – AbbVie Inc.
Table 223 Snapshot – Amgen Inc.
Table 226 Snapshot – Antares Pharma Inc.